These are items which have flaws in their packaging. Discounted 33%. Factory sealed but with minor jacket damage (bent corners or creases) - would grade VG+, while the usual grade is M or M-. If you have any questions, please contact us. 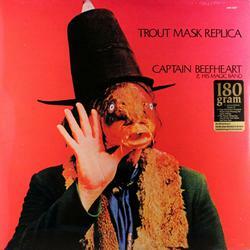 (2-LP set) Trout Mask Replica is Captain Beefheart's masterpiece, a fascinating, stunningly imaginative work that still sounds like little else in the rock & roll canon. Given total creative control by producer and friend Frank Zappa, Beefheart and his Magic Band rehearsed the material for this 28-song double album for over a year, wedding minimalist R&B, blues, and garage rock to free jazz and avant-garde experimentalism.